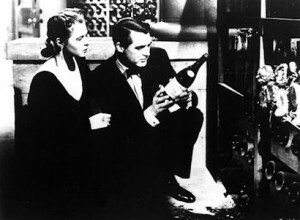 Cary Grant and Ingrid Bergman examine a bottle of Pommard. After a career of 67 years and 53 films, Alfred Hitchcock was one of the greatest promoters of Burgundian wines, handing down to posterity unforgettable images, very French in their nature evoking the wines he loved. Conscious of this surprising notoriety, the Confrérie des chevaliers du Tastevin thanked him by inviting him to join their society in a ceremony which took place at the château du Clos Vougeot in 1960. Hitchcock was deeply honoured. It was one of the few occasions when he smiled. The main difference with someone like Spielberg, whose celebrity is today quite similar, and who acknowledges that he only drinks Coca-Cola, is that 'Hitch' boasted, in typical British style, that he possessed the most beautiful bottles in all of Hollywood. Proud of his professional and social success, the director took an almost malicious pleasure in taking people down to his cellar during one of his many famous lunches which he organised at his home in the fashionable suburb of Bel-Air, near, as he liked to mock, the 18th hole of the famous Los Angeles golf club. But woe betide anyone who tried to touch a flask of his precious wine without his permission. He or she would be forever banned from his presence. The screenwriter Evan Hunter discovered this to his cost when his wife did not behave herself to the liking of Hitchcock. But in truth, what were the most favoured bottles of this Ali-Baba of the cinema? Patricia, the only child of Sir Alfred, looks back with nostalgia to the family lunches and the preferred wines of her father, among which featured Mouton-Rothschild, Cheval Blanc and Montrachet, and including any number of Champagnes, single malt whiskies and legendary Cognacs. This interest found an early home in his cinematographic career. His second film, produced in 1928 in Great Britain, was entitled 'Champagne'. The French title was, alas, rather more prosaic and less evocative: ' l'Americaine'. This light comedy was based in the world of a Champagne producer. The film was preserved thanks to the patronage of the Maisons de Champagne and the British Film Institute. In fact, nearly all of Hitchcock's films possess a moment or two when its protagonists are drinking wine or alcohol of some kind. Vertigo, Marnie, North by Northwest, Topaz, Dial M for Murder or The Man Who Knew Too Much, all his great works are witness to it. In Rear Window, doesn't the future Princess of Monaco seduce the unlucky James Stewart with a glass of Cognac in her hand? In 1979, after receiving the Lifetime Achievement Award from the American Film Institute, Hitchcock retired. In the last years of his life, Sir Alfred particularly loved a Mimosa (Champagne and orange juice). This sometimes made him a bit licentious. Alfred Hitchcock died the 19 April, 1980 at 09.17... After so many crimes and murders, did he remember at this last moment, the place where Norman Bates, the assassin in Psycho, had hidden his dead mother?... It was in the cellar....! "The candles along the side of the road threw a strange phantom light of barrels on the white walls. The evening dresses brought colour to the sombre dinner suits. A hundred invitees, no more, no less, from society: great men and women of the arts, from politics and wine enthusiasts, took their places at tables sumptuously adorned with Baroque candelabra, magisterial bouquets of flowers and red velvet tapestries from Château Talbot, Grand Cru classé Médoc. At the roll of a drum the cup bearers dressed in black aprons brought out the bottles which were put on the tables for the first service: d'Yquem, followed by Mouton-Rothschild, Labour, Haut-Brion, Ausone... A plump silhouette danced amidst the ballet of the waiters. Only a few attentive guests noticed, before it disappeared. Now, it is the moment to serve the mythical Château Cheval Blanc 47… Everyone waits with bated breath, impatient to taste the wine of the century... The wait continues, signs of impatience, whispers, anxiety grows and then a rumour starts, interrupting all discussions. There will be no '47. The bottles have disappeared, vanished into thin air.... Stolen! The word is unleashed... The unthinkable has happened. The burglar is amongst the company, it could be anyone, the deception, palpable agony, terrible! Towards midday the next day, the sun penetrates the living room of a house in the heart of the Entre-deux-mers, on the pedestal table the newspaper Sud-Ouest writ across the front page: “Cheval Blanc, le hold up”. On the table of the dining room, the sun's rays highlight a bottle, on the white napkin some red powder, the bottle is half empty, and from which emanates scents of leather and truffle. The king of suspense, in raptures, savours in silence his pleasure. 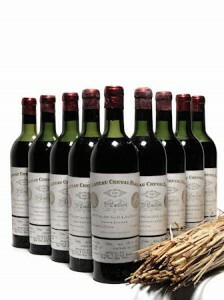 On the label of the bottle, next to the young woman who has accompanied him, is inscribed: Cheval Blanc, 1947."